Gaza City's residents celebrated the release of hundreds of Palestinian prisoners on Tuesday, set free as part of the Shalit prisoner exchange. Over 250,000 Palestinians gathered in the city's main square, where a formal reception is being held in the honor of the 296 prisoners who were allowed to return to the Strip. 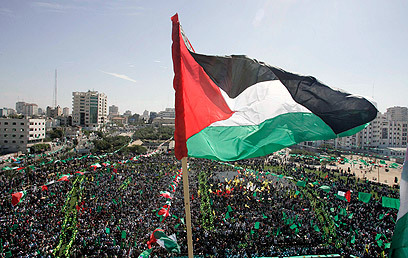 The city's streets were awash with "Hamas green," and Palestinian and Hamas flags were flown everywhere. Welcoming the prisoners back to Gaza were Hamas Prime Minister Ismail Haniyeh, top Politburo delegate in Gaza Mahmoud al-Zahar and the group's parliamentary speaker Ahmad Bahr. Yahia Sanwar, one of the top Hamas prisoners allowed back into Gaza told the masses: "We feel like we left our hearts behind. We left so many prisoners behind… This is a great victory for our people and for the resistance. "This is the first time a deal of this magnitude has taken place. We will not abandon our prisoners to bleed in (Israeli) jails. I urge the leaders of all the resistance's factions and the Izz al-Din al-Qassam Brigades to take it upon themselves and free all of the prisoners soon." Sanwar said that while in prison neither he nor the other Hamas inmates had abandoned terror: "The occupation thought to oppress us and destroy us... The occupation thought it could bend our will, but we turned our cells into schools that taught and trained us for the final battle." Hamas PM Haniyeh added: "We said – death is better that humiliation. We will not bargain over the freedom of these brave prisoners. This is one of Palestine's greatest days. The deal achieved by Hamas is a source of pride for the people. "When Hamas signed the deal we made sure that it included prisoners from all factions, not just Hamas or Izz al-Din al-Qassam… This deal is not just Gaza's deal. It included the West Bank, Gaza, Jerusalem, the 1948 territories and even the Golan. This deal outlined Palestine's new road map and it states that Palestine's borders are the deal's borders." Haniyeh also addressed the Palestinian prisoners' release urged Hamas prisoners left in Israel's jails "to remember that we will not forget you. (Securing) your release is the Palestinian people's duty. He further hailed Hamas' negotiations team and said the deal represented "a new model of Palestinian negotiations." See all talkbacks "Gaza: Masses celebrate prisoners' release"